Leslieville has become known as one of the most sought after neighbourhoods in Toronto in recent years. Situated just east of the Don Valley Parkway, residents enjoy easy access to downtown while enjoying a neighbourhood that maintains it’s own uniqueness and charm. The streets of Leslieville are lined with a mixture of beautiful old Victorian homes and some newly renovated and more modern residences. Several old factories and warehouses have been converted for residential use and a number of newer condos have been built as the neighbourhood has gained popularity. Several wonderful restaurants and bars line Queen Street East, Dundas Street East and Gerrard Street East and the neighbourhood is also home to so many great local shops. 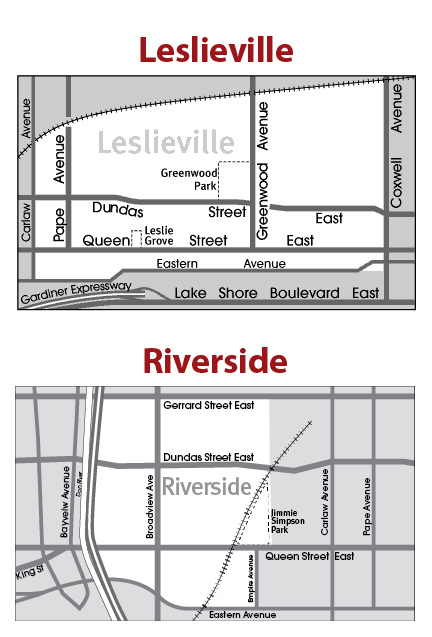 Leslieville is has a number of great recreational areas as well including Greenwood Park and Jimmie Simpson Recreation Centre and it’s also a quick commute down to Ashbridges Bay which is fantastic for Summer volleyball, cycling or jogging. There are a number of fitness centres and yoga studios in the area too. Living in Leslieville allows for easy access to the Don Valley Parkway, The Gardiner Expressway and Lake Shore Boulevard and is only a 10 minute drive or a quick streetcar ride to the downtown core.